First swim in a long time! It was a beautiful sunny day though, so I thought I’d just go for it. 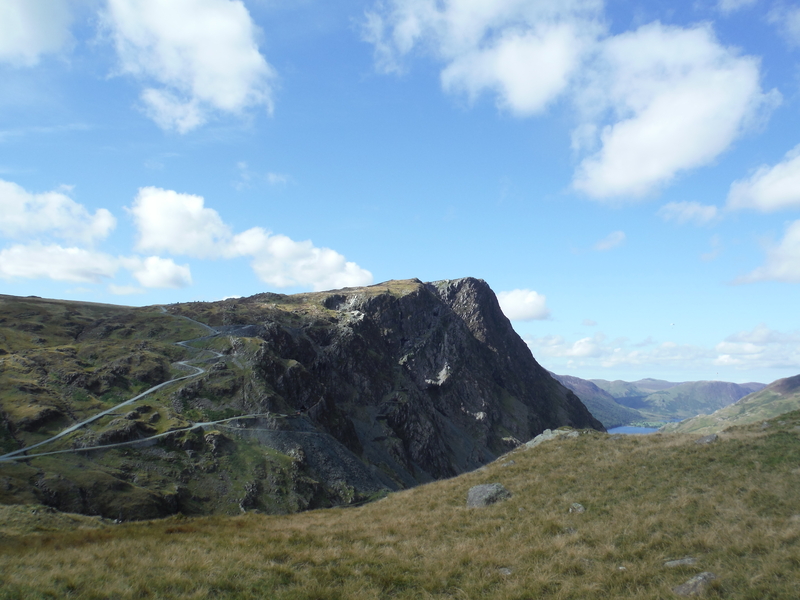 I met Rhys and Ben in Keswick and we headed up to Honister and parked at the back of the hostel. 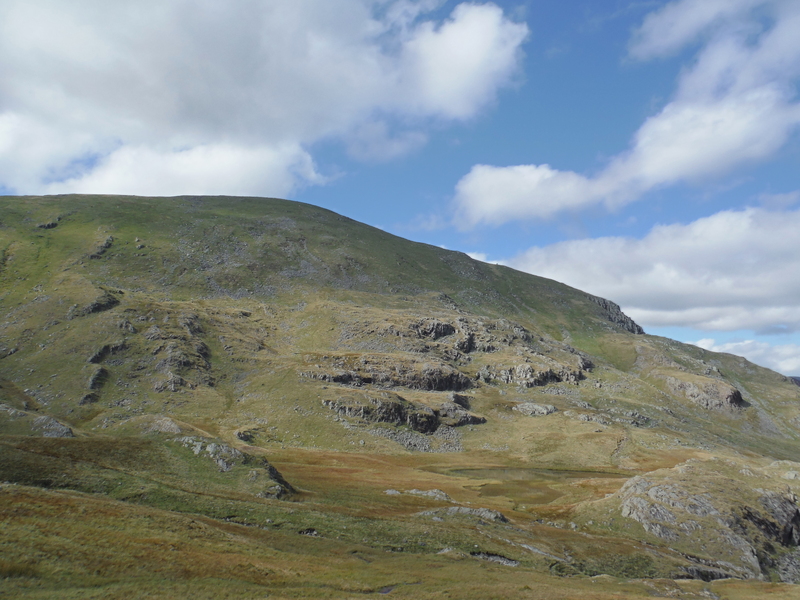 The path up to Dale Head is pretty steep but the views are fantastic, especially on a day like today when it was so clear. The heather is all in bloom and some of the mountains are covered in a beautiful, deep purple blanket, contrasting wonderfully with the greens and browns of late summer in the glorious sunshine. 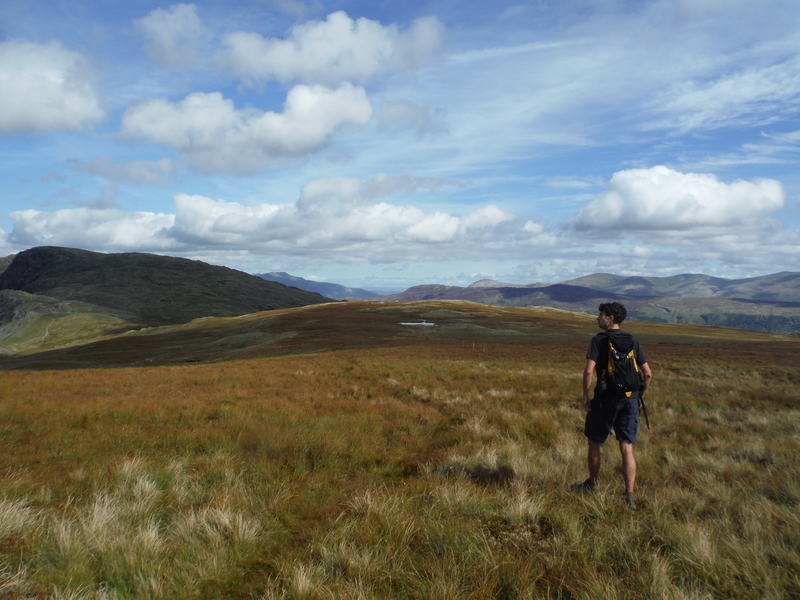 We cut off the path a little way up and traversed the side of the fell to get to Launchy Tarn. Ben got there well ahead of us and tested the water for me. He loves standing knee-deep in the water, but won’t go in any further. 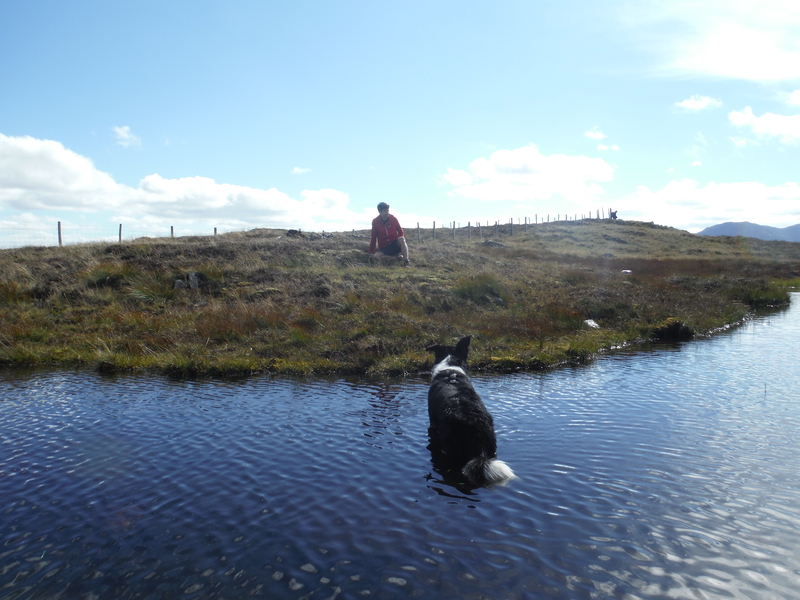 As we got close to the tarn I managed to walk straight into a bog, soaking my shoes. Oops. I took them off for the last little bit of the walk and was glad I did as a moment later I managed to step in right up to my knee. I really should look where I’m going! 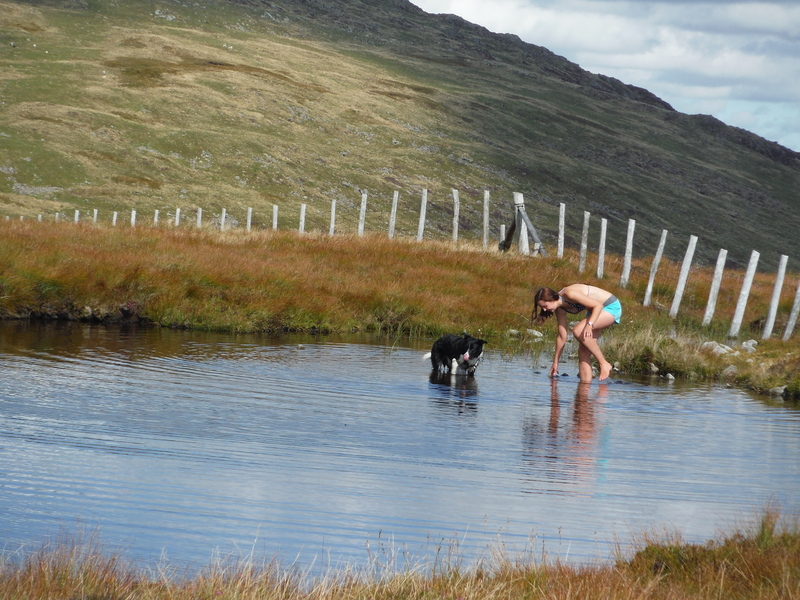 When we got right up to the tarn it became painfully obvious that swimming was not really going to be an option. 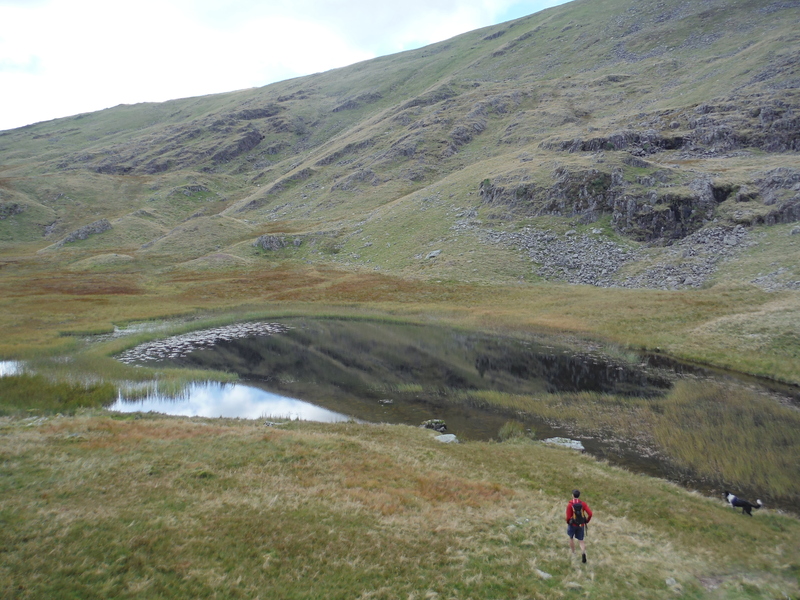 Although it’s not as small as some of the other tarns, it’s very, very shallow… Ridiculously shallow. And rocky. 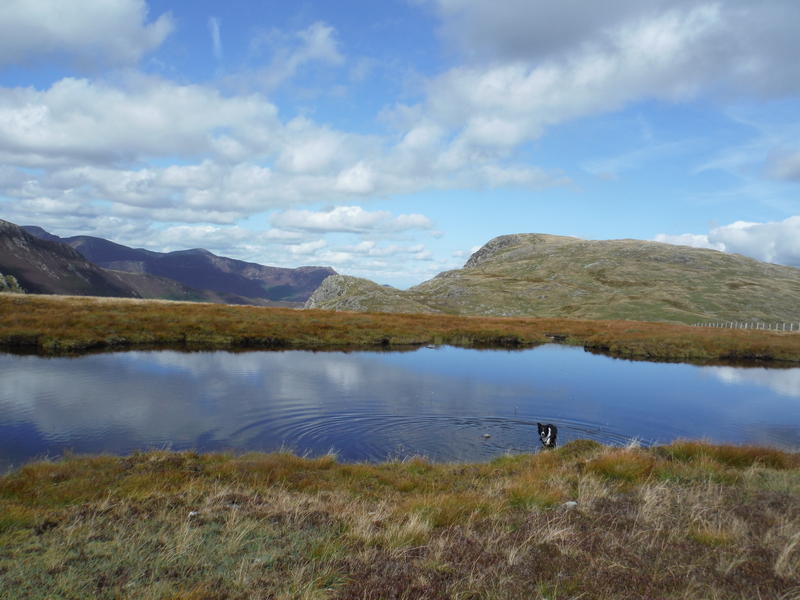 I’ve ‘swum’ in tarns where the water is really shallow, but they’ve always had a thick layer of sediment on the bottom for me to drag myself through. As I made my way around the tarn I could see the bottom in every bit of it, the rocks on the bed only inches from the surface even in the middle. 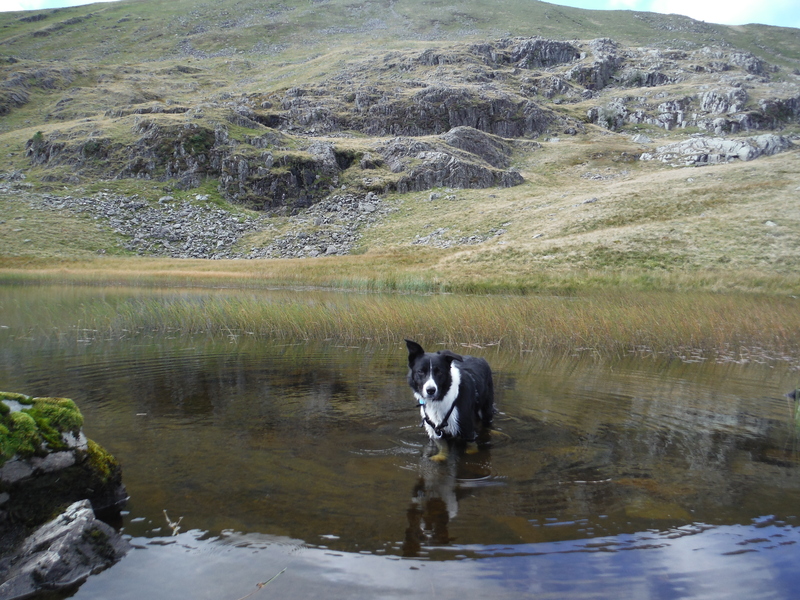 Ben came round with me, clearly approving of splashing around in the shallows, but when I started to make my way to the middle of the tarn he started to get worried about me and darted around at the edge whining and generally looking very concerned about my sanity. I have to admit, he had a point. 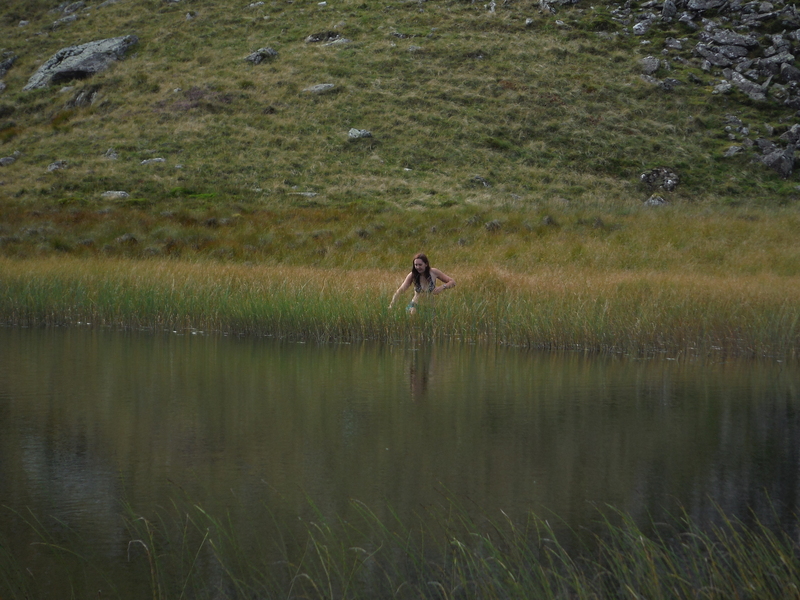 I was walking through freezing cold water, picking my way with bare feet over slippery, painful rocks. The whole way across, the water never even got close to coming up to my knees. 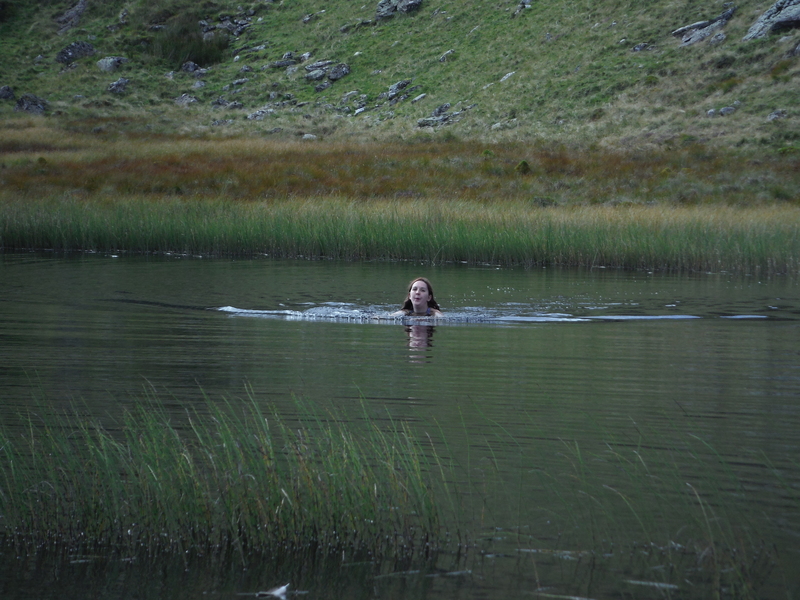 Eventually I tried to lower myself into the water and pull myself along (swimming really was out of the question!) but this just resulted in so many knocks and bangs to my poor knees, already over-sensitive due to the cold, that I gave up and just walked (well… it was more a sort of graceless scramble) most of the rest of the way. 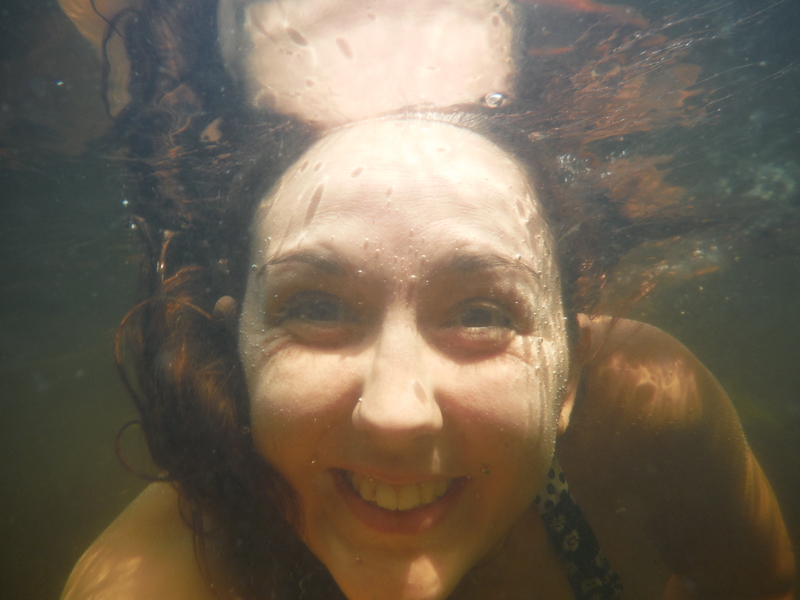 Near the end I did manage to just about get my head under the water for the traditional selfie, but only just! As I scrambled back to the bank Ben was still worrying about me, but Rhys reassured him: ‘It’s alright Ben, she’s just crazy’. 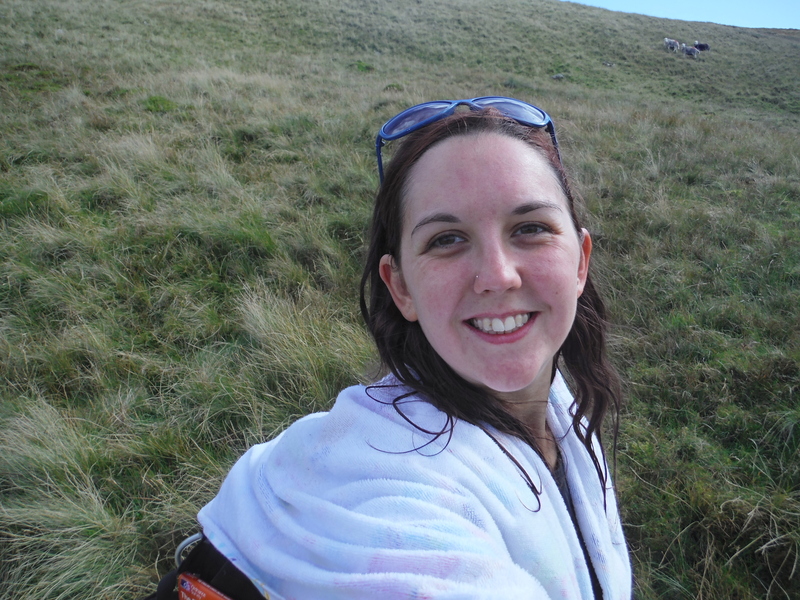 I dried myself off, wrapped my towel around my shoulders and we set off on the short tramp over to Dale Head Tarn. This was much more satisfying. 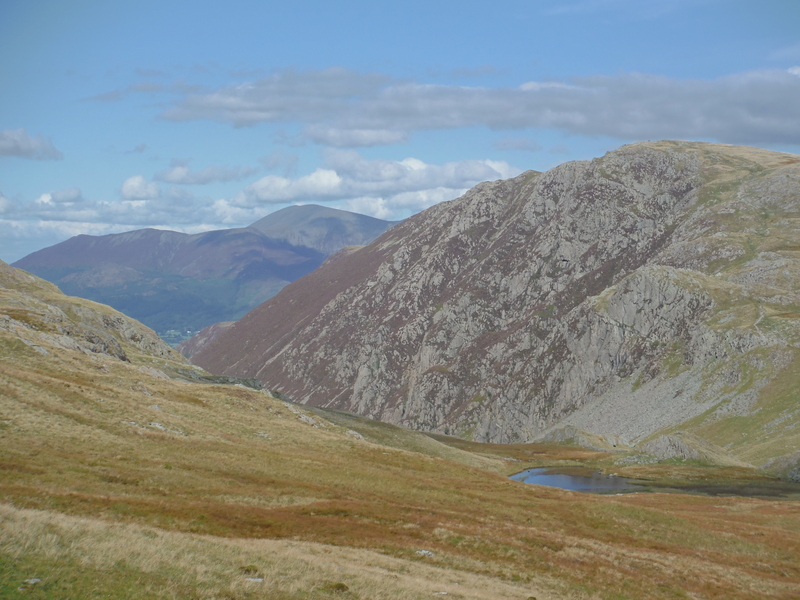 A bit bigger than Launchy Tarn and a lot deeper! 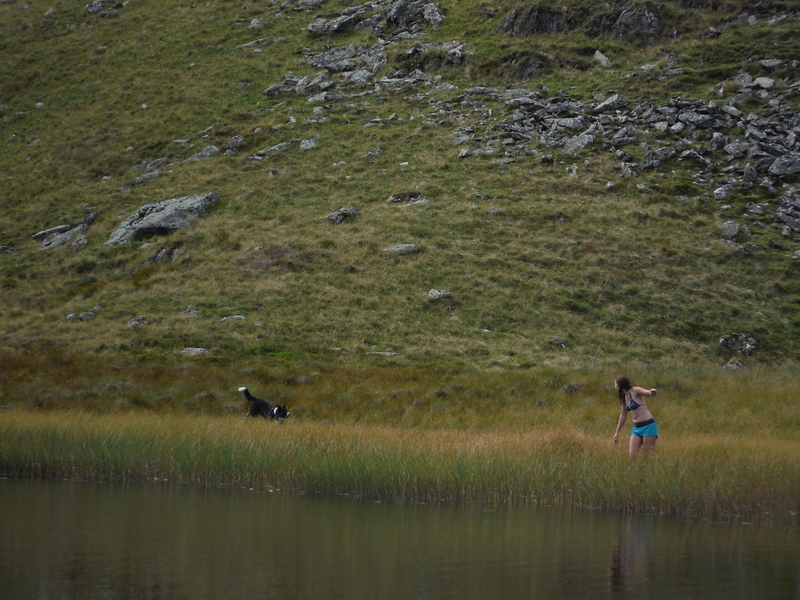 Rhys waited on the bank while I set off round the tarn, Ben at my heels, unsuspecting that I was yet again about to do something utterly unfathomable. 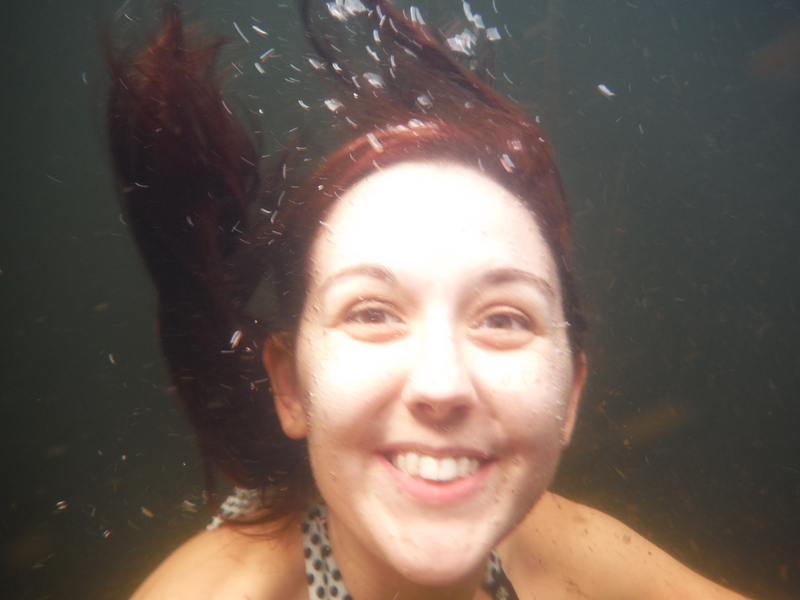 I got into the water among some reeds and through the inevitable thick sediment. I had to do a sort of knees-walk for the last bit to spread my weight around, as each step when I tried to walk normally was dropping me hip-deep into the sludge. But once I got away from the reeds the bed dropped away sharply and I was suddenly out of my depth and swimming. The water was icy cold, but it felt so good to be properly swimming! It only took a couple of minutes to get across which was a shame in a way – I think I was just getting used to the cold when I got out. The water stayed very deep (out of my depth) until I was only a few feet from the shore, which was a bit disconcerting – I kept thinking ‘I must be able to put my feet down by now’ but every time I tried they just met more water. The edge was very rocky which made it a bit difficult to get but Rhys was there, handing me the towel before I was even out of the water, which was very nice! 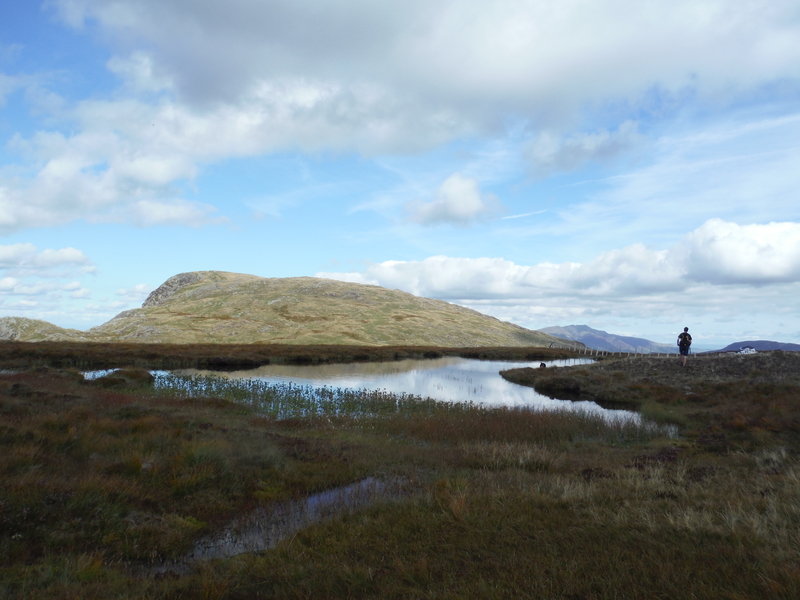 The sun had gone in just as we reached the tarn and now that I was out and dry again it came back out. Typical! It was a really nice swim though, despite the cold and it felt so good to be doing it again. Not sure how many more I’ll manage to get in this year before winter descends on us, so it felt really good to make the most of a sunny day!